Think about the news, or your favorite movie or T.V. show! So right out the door, this prompt is setting you up to find a compelling story about “a time” you failed, which you can then use to explain how you recovered and what you learned in the process. The beauty of writing about a time you failed at something is that you also naturally present yourself as very human, humble and vulnerable, and someone with the maturity to recognize when you messed up. The more I think about it, I couldn’t have come up with a better prompt to help you write a standout essay about yourself! The key, I believe, is to spend a few minutes expanding your definition of failure to see how may directions you could take this essay. Note that it does not mean a complete failure, as in failing a test and getting an F.
It’s more the idea that you tried something, and for whatever reason it didn’t work out. You didn’t have to experience a total flop, or a catastrophe or a complete defeat. Also, the reason whatever you tried wasn’t a success could have been your fault, or not your fault. It could have been someone else’s fault, or the fault of the situation. In fact, there doesn’t even have to be anyone or anything to blame—as long as you turned a problematic (challenging, difficult, unpleasant) experience into something positive. So try to expand your idea of what failure means when you think of past experiences you could relate as stories (incidents or times) in your essay. I would suggest not even looking for a time you “failed,” but a time you didn’t succeed, or win, or finish, or complete something, or get what you wanted, or do what was expected, or when something went sideways, or you changed something about yourself. I can think back to some great essays written by past students that could have addressed this prompt. One student wrote about his love of tying knots and how he got stuck in a tree; and how he used his problem-solving skills to get down. That could have been a failure. Another student wrote about not getting the star role in a school musical, and what she learned playing a less important role. Another failure. If you wrote about a phobia or bad habit–that’s a failure (to deal with it or get over it). The more I think about it, a failure can be construed as almost any type of problem that you either thought you couldn’t get over or solve or handle. If you want to try to write about this prompt, I would suggest you read my Jumpstart Guide or even better, try How to Write a College Application Essay in 3 Steps. Just keep in mind all the ways a “failure” can be the same thing as a problem when you read it. Both these posts will also tell you how to use a story about that problem, in the form of an anecdote, to write your essay. I also wrote several posts to help you learn how to write your stories, or anecdotes. 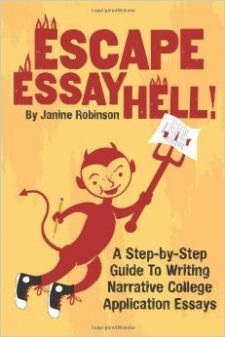 And here are Some Sample Essays to Inspire You. I never thought failure could sound so sweet! If you want help on The Common Application’s Prompt #1, read THIS POST. If you want help on The Common Application’s Prompt #4, read THIS POST. Tomorrow I’m writing about how Oprah Winfrey talked about the nature of failure in the commencement address she gave the 2013 graduating class at Harvard University this past weekend. You will see another reason it makes a great topic! This is my post about Oprah and failure. Hi, I was reading your article on prompts 1 and 2 for the common app. I need help with writing my essay. Could writing about getting through my difficulty of having OCD be one and what I have learned from it. Ho=i. For this essay, I was thinking of writing about making a false assumption about a new classmate. Do you think that this will work for this prompt? Hi. For this essay, I was thinking of writing about making a false assumption about a new classmate, but then this classmate ends up being one of my best friends now & changing the way I look at people. Do you think that this will work for this prompt? Hi. This might be a silly question, but how much of the essay should be story-telling and how much should be reflection? I’ve written my essay on this prompt, but looking back I feel it might tell too much of a story and too little of what I learned. Thanks for any help! What if you don’t know what failure to write about? I have one in mind, but it just seems too depressing and I feel like the readers might just think I’m hopeless. Hi, would it be a good idea to extend the example of one failure into my personal story and elaborate how I overcame the problems in my life? Would that be stretching it too far from focusing on one failure? Thanks in advance! Hi!I do not want to make my essay so “uptight.” What kind of failures can I write about? Would failing my permit test be a good one? Hi, I wanted to write about how a certain sport played a great role in my life and was fond with it ever since i could remember. But even though i worked hard and gave it my all, the coach never selected my in the team. Woud this make a good essay? Hey, I wanted to write about the experience I had when I found out I was going to be a father at a very young age of 19. The challenges I had and sill have and how things were at a first.. Would this be considered as a failure? And how will I make it more captivating and touching? Should I go for it? Could failed expectations of oneself in life work? Speaking from being a little older and applying as a transfer student. It sounds vague but I believe it can be written concisely and it’s a deep rooted issue so it has the emotion behind it. Hi Cam, I’m probably answering this way too late to help you, however, for anyone else who can relate to your awesome question: I think you could write about this, but you would want to make sure to put a positive spin on this. If you share your “failed expectations,” make sure to provide specific examples, and then QUICKLY to into what you did about those and what you learned about yourself. And where you intend to head next and why. Good luck! Would it makes sense to describe my failure in not being able to fully participate within a sport that I enjoyed because of my disability and how this failure made me aware of my hidden feelings about myself living with this condition and how becoming more self aware of my feelings I began to change the way I looked at life in a new positive perspective. Would it be okay if I wrote about someone else’s failure and then talk about how I learned from it? For example, my sister didn’t do so well in highschool and didn’t go to college. Could I talk about how I learned from it?